Christopher’s Favorites ☞ Nutella and Go! 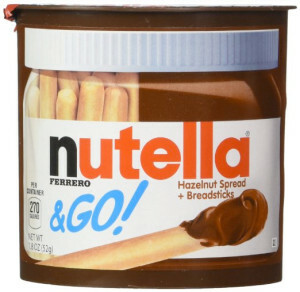 If you ever been stuck somewhere awful like an airport terminal during a long flight delay or a high school band recital and thought, “I wish I had a small container full of Nutella that I could eat right now without using a spoon or my own fingers,” this is the completely unhealthy snack food delivery system for you. Yes, it really does come with actual breadsticks inside which you can use to eat the hazelnut infused chocolate – what do we even call Nutella? Is it a syrup? A spread? Is there any word for that doesn’t sound alarmingly sexual? Well, as any Nutella enthusiast will tell you, it’s best just to eat the stuff and not ask too many questions about it.